This post includes three lunches packed for work. These are examples of how lunch packing can be quick and simple if necessary. All you need is a good container, a plan, and some handy food. The first lunch is packed in one of our Goodbyn boxes. I originally bought these thinking I would use them for our kids, but then realized they hold more food than our kids usually eat at one time at school so I have ended up using them for adult lunches for work. If you are looking for a simple, durable box that can be easily washed in the dishwasher, the Goodbyn boxes are good options. Our have lasted for over five years and I have used them once or twice a week at least. 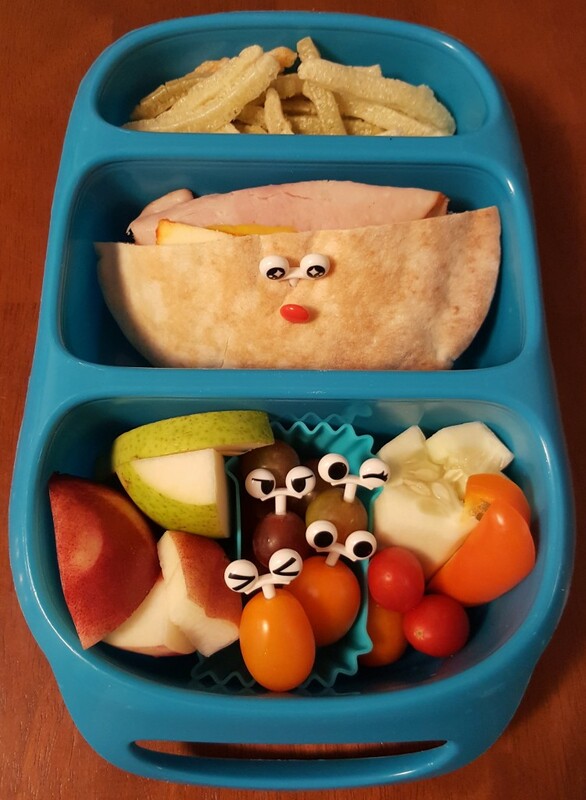 The lunch below included veggie straws, a ham and muenster pita pocket sandwich, fruit and veggie. I added a few eyeball picks for fun. The next lunch was packed in our Omiebox. This is another box I originally planned to use for our kids, but ended up using for adults. It has a removable insulated thermos-like container that fits in the square section shown below. I mostly use this box without that container. The Omiebox is a deep box so it works well when including sandwiches packed with thick breads like baguettes or ciabattas. 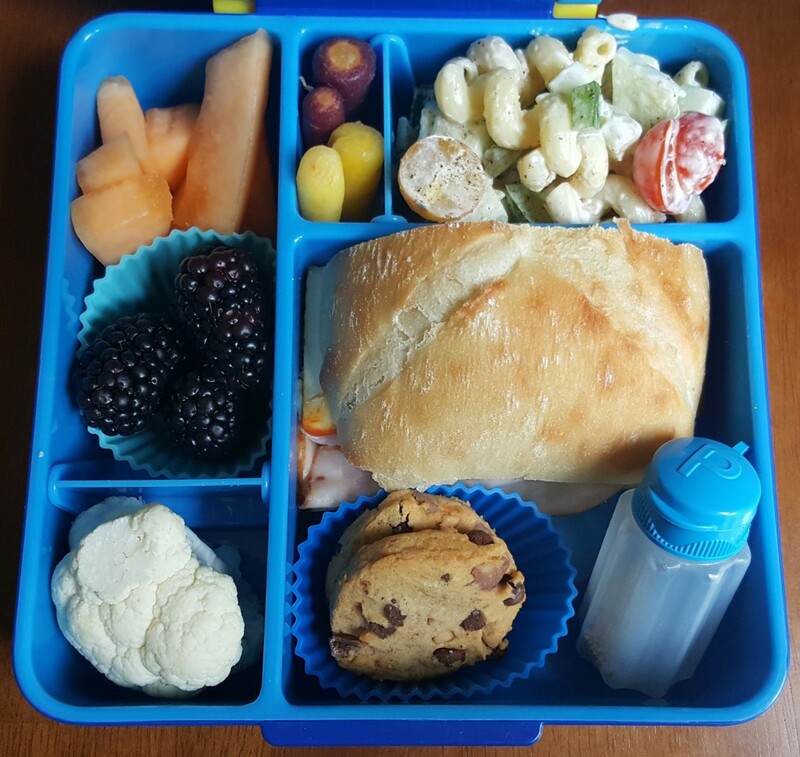 The lunch below includes a little macaroni salad, yellow and purple carrots, cantaloupe, blackberries, cauliflower, a sandwich, and cookies. The little pepper container was included because my husband likes to add extra pepper on his macaroni salad. This third lunch was packed in our Planetbox Launch. These lunch boxes are expensive when first purchased, but they are extremely durable and handy. 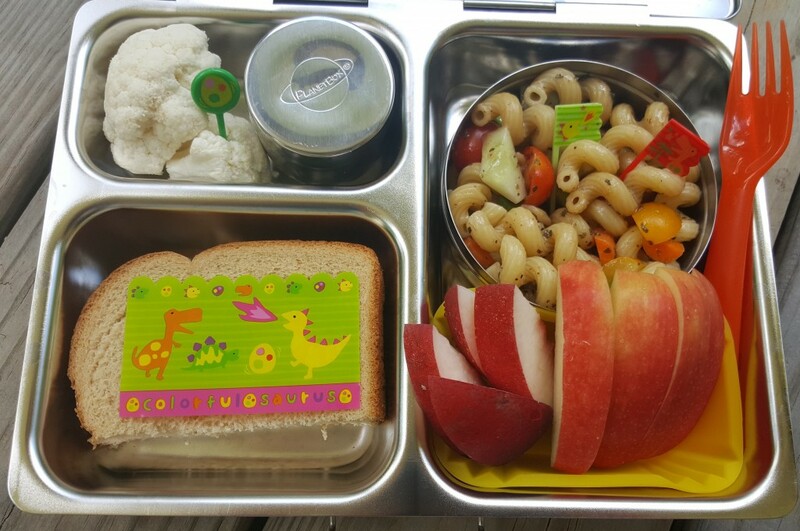 This lunch included cauliflower, trail-mix in the little round container, a sandwich, pasta salad, pear slices, and apple slices. I include silverware from IKEA in many of our lunches like the fork shown below. These fit inside several of our boxes so I can put them in when packing the lunch (and not forget to include them in the mornings). These forks also wash well for reusing, but they are also inexpensive and easily replaced if not returned home. I added some dinosaur picks and baran to this lunch for fun.